Last year I wrote a book summarizing pretty much all that I have to say about the past, present and future of youth ministry. 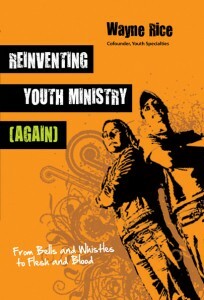 The book is titled Reinventing Youth Ministry [Again]: From Bells and Whistles to Flesh and Blood and it was just released this month by InterVarsity Press. I began my youth ministry career in 1963 as a Youth for Christ club director, ran junior high summer camps at Forest Home, served as a youth director in a couple of Nazarene churches, then started Youth Specialties with my old pal Mike Yaconelli. All of that took place long before many of today’s youth workers were even born. So I thought I would share some of that history as a kind of memoir, along with a few observations on how youth ministry has grown and changed (for better and for worse) over the past 40 years. The book contains a lot of stories, a few rants, and my best shot at trying to describe what good youth ministry should look like in the future. I put all of this down in a book and was simply amazed that a respected publisher like IVP would agree to publish it. Reinventing Youth Ministry [Again] has only been out a couple of weeks now but the response has been pretty gratifying. A couple of friends who got advance copies said they couldn’t put it down. And I was just blown away by the kind endorsements written by Duffy Robbins, Walt Mueller and Mark DeVries on InterVarsity’s website. Best of all, my son Nate gave the book two thumbs up and my wife Marci told me it was the best I’ve ever written. That’s about all the affirmation I need, really. I’m just very grateful. My prayer now is that it will be used by God to encourage better youth ministry in the future and result in more and more young people coming to know, love and serve Jesus for years to come. If you do get a chance to read this book, I would appreciate your comments. It’s available not only through InterVarsity Press but from Amazon.com and other online vendors. This entry was posted in Ministry and tagged books, Forest Home, InterVarsity Press, writing, youth ministry, Youth Specialties. Bookmark the permalink. It’s on my list. I can’t wait to dig in. You’re going to love this one Adam! Loved the book! As someone who has been both a youth and a youth leader in the mainline/progressive church, it was very interesting to read of the origins of youth ministry in the evangelical and parachurch movement. Hi Wayne, Great to connect with you in the van ride from the airport at the NYWC! I picked up your book and read it during low times at the Convention and on the plane ride home. I am so thankful for the history of YS, Mike Y. and yourself. As well as the challenge and encouragement to keep moving forward by involving parents and the whole congregation in YM. Well done. Keep going! I look forward to connecting again! Jeff, great to meet you in Nashville and I’m looking forward to reading your new book also. It sounds like something I can use as a resource in my position as Pastor to Generations. I think we have a lot of ministry goals in common and hopefully our paths will cross again soon. If you could email me with any hints about how you made this blog look like this , Id appreciate it! This blog is a WordPress blog … and you don’t have to be a geek to set one up. It might be easier if you are one, but I don’t think you have to be. A good friend of mine helped me get mine set up but after that, it’s pretty easy to use.